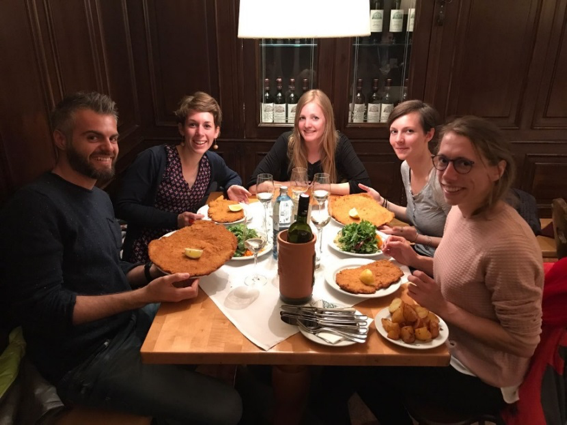 This year, several IMPREX ECS attended the European Geosciences Union (EGU) conference. 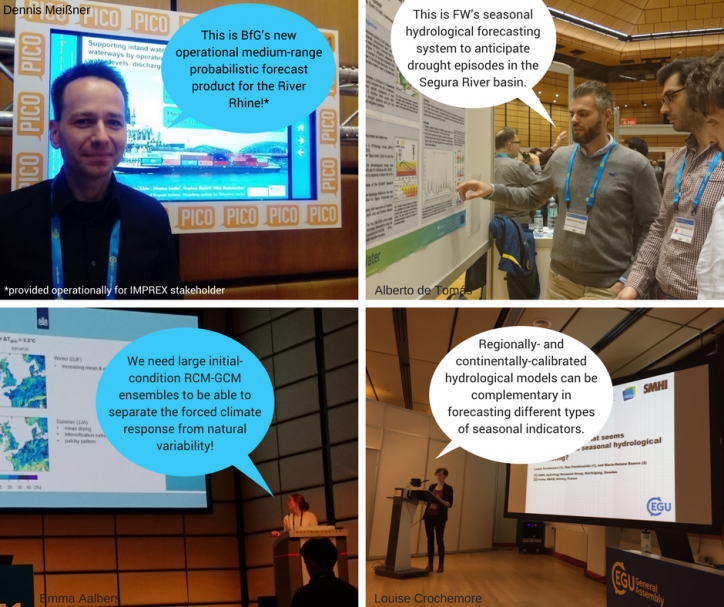 The research they presented covered a large breadth of topics (click on the hyperlinks to read the EGU abstracts). Sub-seasonal to seasonal hydrological forecasting was a hot topic, with ECS’ presentations and posters on medium-range to seasonal streamflow forecasting for navigation in Central Europe (Dennis Meißner), seasonal hydrological forecasting for drought early warning for the Segura River basin (Alberto de Tomás), and for compound flood early warning for the Thames River basin (Jess Neumann), seasonal streamflow forecasting and model calibration (Louise Crochemore), the use of large-scale teleconnections for seasonal hydrological forecasting for the Lake Como (Matteo Giuliani), the influence of seasonal-scale antecedent conditions on flood risk in sub-Saharan Africa (Konstantinos Bischiniotis) and the concept of a more efficient operational seasonal streamflow forecasting system for Europe (Louise Arnal). 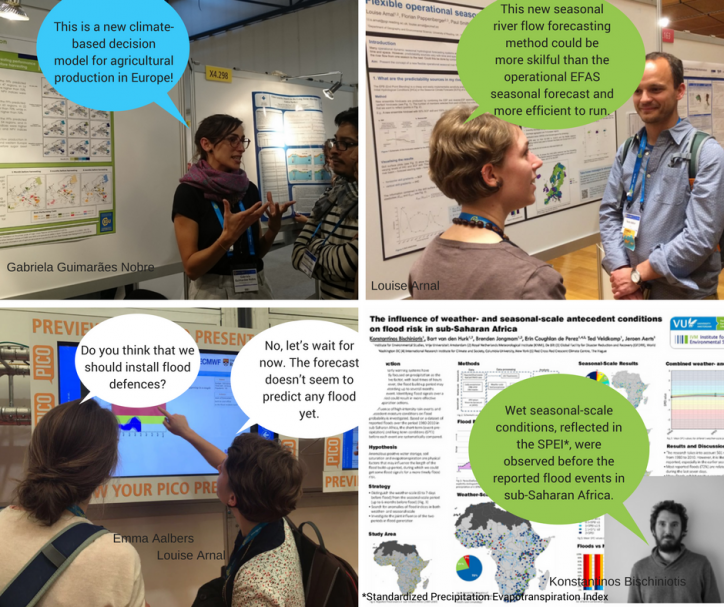 Another very popular topic was climate modelling and variability (Emma Aalbers) and its implications for agriculture and extreme floods in Europe (Gabriela Guimarães Nobre). 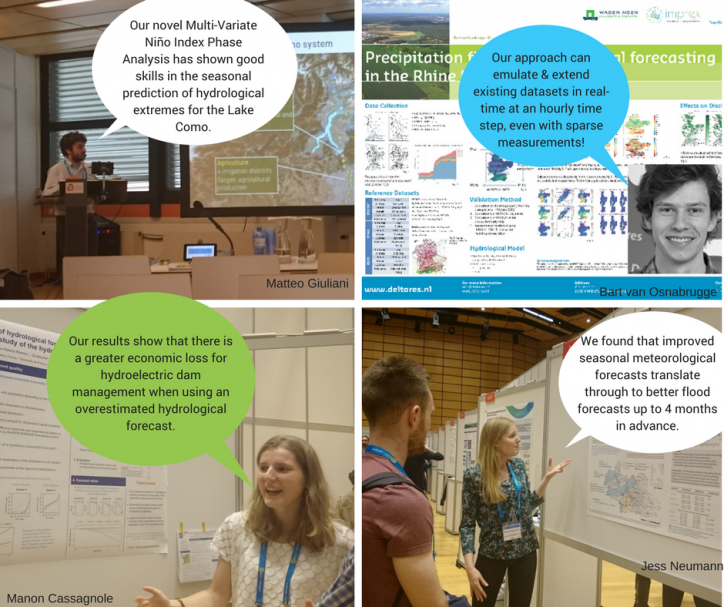 Finally, posters were presented on the creation of a precipitation dataset for operational forecasting in the Rhine River basin (Bart van Osnabrugge) and the economic value of ensemble forecast for hydroelectric dam management (Manon Cassagnole). Louise Arnal presented a new HEPEX-IMPREX educational game at the PICO session on “Operational forecasting and warning systems for natural hazards: challenges and innovation”. This game was co-developed with other IMPREX partners: Emma Aalbers, Matteo Giuliani, Louise Crochemore, Maria-Helena Ramos, Florian Pappenberger and Hannah Cloke. The game aims to highlight the complexities of the decision-making process for flood protection. This game was played at the IMPREX GA in Reading! If you would like to know more about one of the ECS’ research, don’t hesitate to contact them via email!